Around the world, the Accounting profession largely operates under the same business model. The model is predicated by labor hours and charge rates. The old model is a ‘labor for hire’ business. The theory is that more labor hours that go into the client project, and the higher the charge rates realized, will guarantee larger profits for the owners. This is quite true that more hours and higher charge rate will result in larger revenue – and, of course, if the costs are under control, then there will ultimately be higher profits. The challenge with the model is that it predicated on charging more labor – typically more than the project actually needs. And, most certainly, the project price does not reflect the value that was contributed to the clients’ project. The other issue of charging by the hour is that it encourages bad behavior. When you charge by the hour, you are not incentivized at all to do the project in the least, most efficient time possible. Quite the opposite. You and your team are incentivized to do the project in the most amount of time possible. 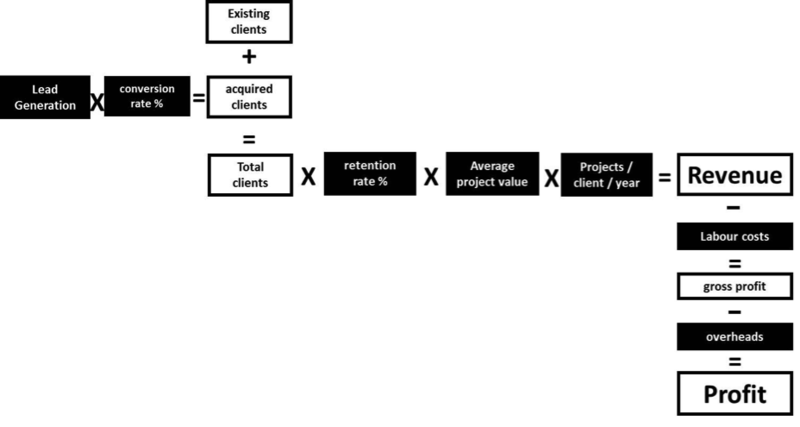 Invariably, firms price each project after the fact, based on hours and rate. And, to make matters worse, before billing the project they often ‘write it down’ (discount), and thus, their ‘realization’ is reduced. Your clients have no idea how much it will cost. You and your team are incentivized to go slower and make mistakes. Your client often ends up paying more than they need to. It’s a highly ineffective model for driving efficiency, and it is a poor profit model because everything is based on time. The diagram below highlights the way most firms operate. Even when they grow by headcount, they do not necessarily grow by profit. Attracting the right type of clients to your firm. Making sure all clients have every service they need to achieve their goals. Completing client projects in the most efficient way possible. Making sure you earn a fantastic profit for your value contribution. The new model is predicated on pricing every single project ‘upfront’ based on value, rather than time. Once the project is priced upfront based on value (and the price and scope of the project is communicated with the client in advance), then you can have an internal ‘hours budget’ on the project. Once priced upfront, your mission now is to complete the project in the least amount of time possible, with the highest quality control – thus delighting your clients and creating capacity for you to do more with the same resources. With the new model, you get rid of charge rates (but keep timesheets) and you take previous charge rates to $1 per hour. You keep the timesheets as a measure of performance, and eventually get rid of those as well. Under a ‘price up front’ model, charge rates are surplus to requirements, as you will never price based on value with a charge rate model. The new model has a very active marketing and sales function, looking for new clients and new projects within existing clients. The new model does not ‘drive billable hours,’ yet you still measure the efficiency of your people through the average margin achieved for the entire team. You also still measure ‘productivity or utilization,’ so that you can plan for capacity and growth.